Yield: Yields about twenty-eight 2-inch sandwich cookies. 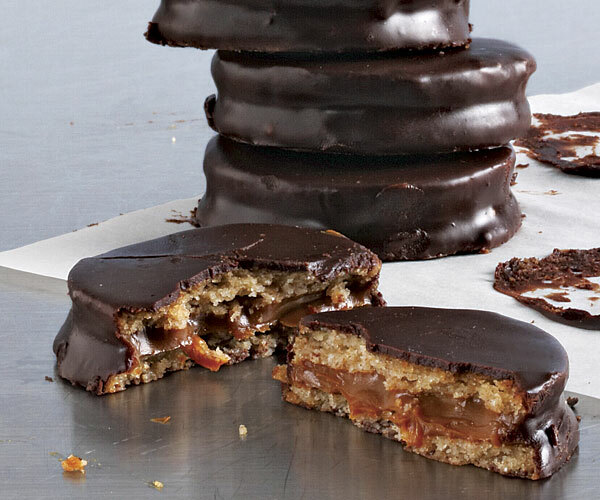 My wife is from Argentina, and the first time I traveled there with her, I fell in love with alfajores—delicate shortbread cookies with a gooey dulce de leche filling and a coating of dark chocolate. Several years—and many cookies—later, I was finally able to recreate them at home, just the way they tasted in Argentina. 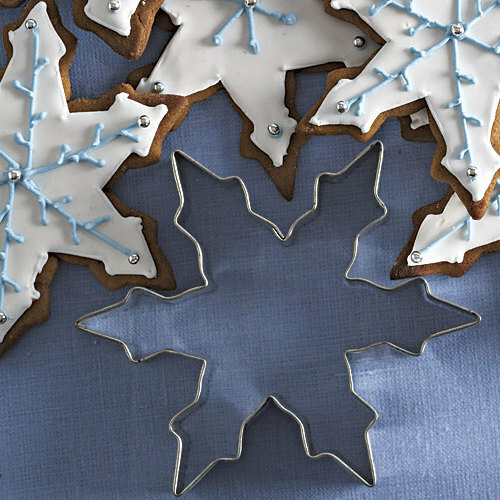 They’ve been our holiday go-to cookie ever since. Web extra: As part of Fine Cooking’s Virtual Cookie Exchange, Andy demonstrates the technique behind these cookies. Watch the playback to learn why Andy doesn’t temper the chocolate, why he uses an offset spatula, and how he makes relatively quick work of dipping the cookies. In a medium mixing bowl, whisk the flours, baking powder, and salt. In a stand mixer fitted with the paddle attachment, cream the butter and sugar on medium speed until light and fluffy, 2 to 3 minutes. Stir in the orange zest. Scrape down the bowl and paddle with a rubber spatula. With the mixer on low, gradually add the flour mixture to the butter mixture. After adding the last of the flour but before it’s fully incorporated, add 1/4 to 1/3 cup cold water and mix just until a smooth dough forms, 1 to 2 minutes. Divide the dough into two equal pieces, form into disks, and wrap in plastic. Chill overnight. Position a rack in the center of the oven and heat the oven to 350°F. Line 2 cookie sheets with parchment. Roll out the cold dough on a lightly floured surface until it’s 1/8 to 3/16 inch thick. With a 2-inch plain or fluted round cookie cutter, cut the dough in circles—you can gather and reroll the scraps once. Bake one sheet at a time until the edges are very lightly browned and the cookies puff up slightly, 8 to 10 minutes. Cool the cookies on a rack and store in an airtight container for up to 3 days or freeze for up to 1 month, until you’re ready to fill and coat them. Lay out the cookies, flat side down. Put a heaping 1/2 Tbs. of dulce de leche on half of the cookies. Cover each with a top cookie, flat side up. Put the chocolate in a small, deep, heatproof bowl. In a small saucepan over medium-high heat, bring the cream just to a boil. Pour over the chocolate and let sit for 10 minutes. Stir the mixture very gently, incorporating the cream steadily and without overworking, until glossy and completely mixed. Line 2 cookie sheets or rimmed baking sheets with parchment. Pick up a sandwich cookie with a small offset spatula. Immerse in the chocolate mixture, flipping the cookie to coat completely. Pick up with the spatula and tap a couple of times on the side of the bowl to get rid of excess chocolate. With another spatula in the opposite hand, gently smooth out the top of the cookie and then run the spatula along the bottom. Transfer to the parchment-lined sheet. Repeat with the remaining cookies. Allow the coating to set at room temperature for a few hours and then serve. Store in a plastic container, separating each cookie with parchment or waxed paper, in the refrigerator for up to 2 weeks or freeze for up to 3 months. I made this cookie for my son's school project and I found the cookie to be tasteless.I followed the instruction from the original maker in the reviews and adjusted the recipe as was suggested. I used Merkins chocolate which can make anything taste great but it didn't help these cookies. They looked great but tasted plain. I would not make these again. Although I think it is a great idea, it feels like a very complicated recipe to duplicate. They pictures look fantastic. Sometimes we find cookies and desserts in bakeries and we want so badly to be able to make them ourselves, and this recipe really allows us and food lovers to see how hard it is sometimes to find a great recipe that is easy! I work for Better Recipes so I am constantly looking for better Cookie Recipes and although this one is very interesting - it feels a bit too complicated for the average chef.